Anything that has visionary effect can be recalled easily. The concept of posters and banners that we see around us is exactly the same; to have an effect after seeing it, to make things remembered. Posters are a great way of making information been displayed so that it reaches out to people and is understood well. Posters catch attention very easily. There are thousands of other ways to convey messages but the main objective is to make the point stick in one’s head that you are trying to deliver. For that one needs to pay attention careful and that’s not something on your hand. So what you can do make things visually gripping so it draws attention easily. It is now scientifically proven that posters are one of the most effective ways to deliver ideas. Posters are very useful when it comes to display any complex message within a short interval of time. It is not always you will have time for presentations or discussions, thus through the help of posters one can easily put any idea and deliver it within a short span of time. Posters help spread information in fastest way. Therefore, if you are organizing a concert or an event you must have posters designed to have effective overviews. Below are some great ideas of designing posters for events or concerts. Paper is one key tool for expressing: One of the great things about poster is things are printed in a wide sheet of paper. You can express your views and ideas and get them printed in a unique that will attract attention. Make it stand out from the lot if want to create an impression through your poster. Make your poster visually dynamic that looks appealing and easily conveys exactly the matter or theme of your concert/event. Use darker Background for your Poster: Always go for dark background shades. Do not use lighter shades in the background as it kills the prominence of the writings in the poster. Things become difficult to see with a lighter background. Thus a dark background especially its good if the background colour is black, reflects thing much brighter way. With dark background use contrast bold block letters to the background. Select shady bright light to enhance your poster. Your poster will be the statement of your event. 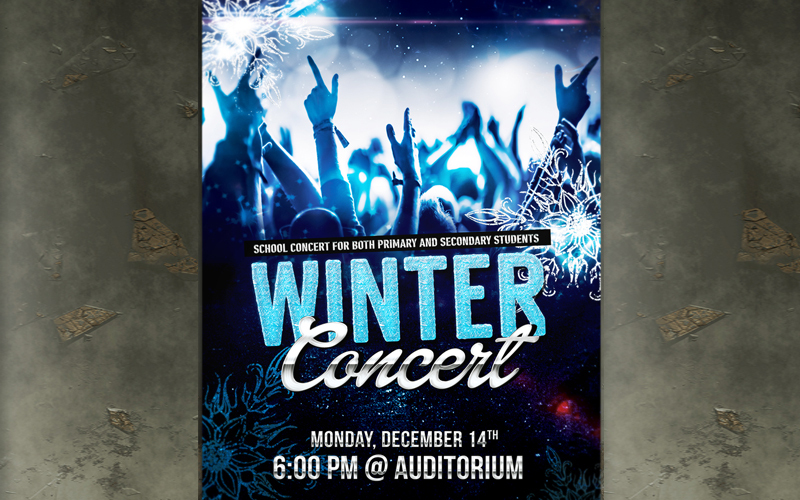 Your poster should attract audience before your concert gets started, that’s how your concert will be a hit. Important Things Should be Highlighted on the Poster: Remember when you are making poster for your event never miss out with the important facts such as; date, time, venue, title of your concert. They are main things that will bring your audience. All the important stuff should be clearly and neatly highlighted on your poster, so that people can easily find it when they look at the poster for the first time. They shouldn’t have to struggle to find the main facts of your concert/event. Image Speaks Louder than Words: Another significant part of the poster is selection of images. Posters are something that people don’t spend hours on observing them. They just go for at a glance on the poster. So obviously crowding your poster with lines is not a good idea. Here comes the concept of image selection that will make or break the poster. An image can easily portray that your concert/event is all about. Thus an appropriate image selection is one key thing of your poster. An exact and good image selection will create much difference to your event/concert. Include Extra Interesting Activities on the Poster: When you making a poster add some fun interesting activities that your concert/event will be organizing. This will attract more audience as they will know there are fun activities to participate in the event/concert they are attending. You don’t need to spend extra bucks for marketing, people will indirectly do it for you when they will find these interesting facts and tell their family and friends to come and join the concert/event. Add Your Social Media Links: These days Social Media play a vital role. Thus adding social media links of your event/concert on the poster is one mandatory fact. Adding social media links attracts more viewers to your concert/event’s page. People are more active on Social Medias these days and so things spread through internet. Advertise your Poster on Popular Social Media Sites: The more you advertise and showcase your poster the greater audience you have. Take pictures of your Poster and add them on popular social media sites so that people know better. Post everything regarding your concert/event along with the poster. Try to follow all these above tips if you are looking forward to design a poster for your upcoming event/concert. It’s your poster that will speak about the event/concert you are throwing. Thus making an appealing poster is important for the success of your concert/event.